Forecast thunderstorms across much of NSW have prompted asthma warnings from authorities. 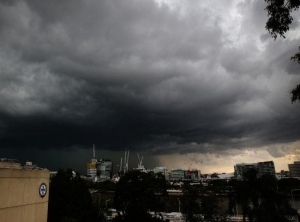 A storm front sweeping across NSW could trigger serious breathing problems in some people, health authorities have warned. Thunderstorms are predicted for parts of the state on Tuesday afternoon, including the north coast and Hunter regions. NSW Health's Richard Broome said high levels of pollen in the air could trigger asthma and respiratory conditions as the storms approach. "Thunderstorms cause pollen grains to explode and release fine particles which can be inhaled deeply into the lungs, causing even more people to wheeze and sneeze," Dr Broome said in a statement on Tuesday. The warnings come after 3600 people presented to hospitals in Melbourne with breathing problems following storms in 2016. At least nine deaths were linked to the event. Sydney has never recorded a thunderstorm asthma event of a similar magnitude but rural NSW has, and the health department is urging sensitive people to be extra vigilant. "Anyone with diagnosed asthma should carry their asthma medication with them at all times during this high-risk period," Dr Broome said.